Boy, do I miss the days when Mike Vraney’s Something Weird Video partnered with Image Entertainment to release exploitation titles as feature-laden, double feature DVD’s. 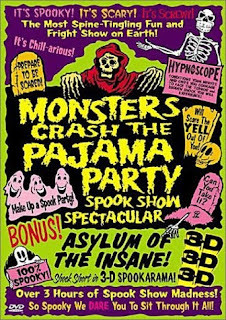 The Monsters Crash the Pajama Party Spook Show Spectacular DVD is the “ne plus ultra” of these things and stands as a shiny, round, aluminum tribute to all the things I love. Inserting the DVD into the player leads directly to a display of endlessly spinning concentric circles and a scary narrator intoning that he will “hypnotize us to heighten the horror of the show to come.” Apparently, this is an example of “Hypnoscope.” All I know is that it freaks me out. The menu is up next, and what a menu it is—except for the names of the commentary track “spook show maestros” written on a tombstone, the menu contains no labels or text of any kind, but rather a visual landscape the viewer must maneuver and explore via their DVD remote to discover “clickables” that lead to the disc’s hours of films and special features. Cool, babies-- just hand the remote over to the kiddies, who will treat the thing as a video game and have the landscape and choices all memorized within minutes. It’s very confusing. I swear; there are some choices on some of the menu screens that do not appear until one has gone away from that screen and then returned. Happy hunting! I am still convinced there are some special features and Easter eggs that I have not yet seen, and I have played with this thing for hours. 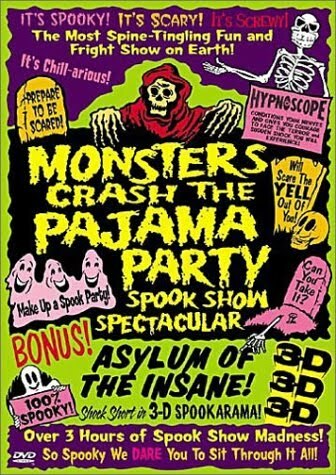 The main attraction here is the spook show/movie amalgam Monsters Crash the Pajama Party. This cheesy, low-budget, barely feature-length curiosity was originally shown in movie theaters where volunteer theater employees donned full-body costumes (a gorilla, a werewolf, and a hunchback lab assistant) and ran into the darkened theater at a pre-set cue in the movie itself. Each “monster” would grab a screaming patron and carry her out of sight. After a few moments, the monsters on the screen seemed to carry the “audience girls” back into the movie itself. I would love to know how this actually came off during a real screening. SOME HISTORY: In the forties and fifties, roaming bands of theatrical ne’er-do-wells made a living, crisscrossing the country and presenting “Spook Shows” at local movie theaters. Often held at midnight, these shows would consist of a short horror film screening, a staged live séance, magic tricks and illusions, and often- costumed actors running through the darkened theater, scaring the crap out of everyone. 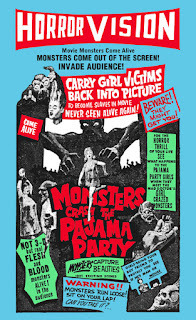 Monsters Crash the Pajama Party was the (largely failed) attempt to catch the “lightening in a bottle” of the live spook show in a feature film. The Something Weird disc celebrates all things “Spook Show,” featuring audio interviews with two legendary “ghost masters:” Philip “Dr. Evil” Morris and Harry “Dr. Jekyl” Wise. The interviews play over the main feature as an ordinary director’s commentary would. 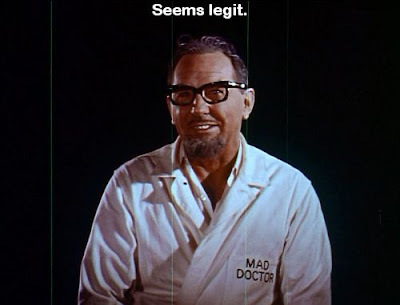 The disc includes a booklet, “Secrets of the Spook Show” by Jim “The Mad Doctor” Ridenour. I am supposing that, like Italian mobsters, the men who made a living putting up spook shows all eventually ended up with colorful nicknames. Somehow unsure about the bounty I have described above, the producers also throw in an extra bonus, Bert I. Gordon’s low-budget 1960 thriller Tormented. That’s right, babies-- an entire extra feature film! Gadzooks--all of this for less than eight bucks? Order now, babies—Halloween’s coming and Amazon might just sell out of this title, given that I am purchasing one for each of my friends, so that’s one copy right there. Love this one...JB you are the best! Long live Mike Vraney! 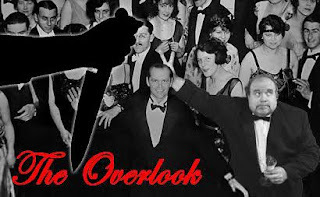 I have this same DVD, and I totally agree with J.B. that it is indeed a treasure trove of monster-y goodness. In fact, this article inspired me to go find it and watch parts of it tonight! 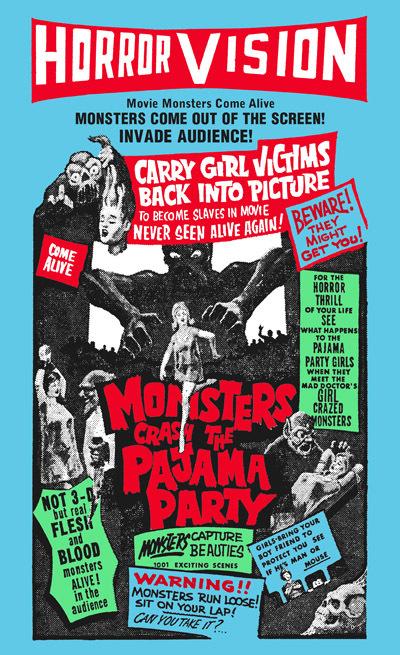 The only downside is that unless you were there, we'll never truly know what it was like to be at one of these old-timey live monster movie shows. Sure, some stuff like this still exists on the fringes (I'm going to a Twin Peaks-inspired movie night with live music in place of the score later this month), but these can't recapture the stuff depicted on this DVD. We can only wonder what it was like to be there, as ACTUAL MONSTERS ran through the dark theater full of screaming teens as lighting and thunder flashed and boomed on screen. Or, perhaps, it is greater in our daydreams than the real thing ever could have been. The other fascinating thing about the Monsters Crash the Pajama Party DVD is all the little mysteries you can discover when reading all the different text pieces. Like, what were these "paint pill envelopes" given to teens before the movie? Fake blood? Drugs? Something else entirely? I have no idea. Several of the advertisements promise "win a dead body" contests. Huh? What? But what really ignites the imagination are the DVD's text stories about the girl buried alive, apparently as a stunt that took place at the theater just before the movie started. The info on the disc tantalizes us with stories of this taking place, but then pulls back before giving us the specifics on just what the stunt was and how it was accomplished. This leaves it up to us to picture the girl buried alive in our minds. Now, if I'm ever in an old movie theater, I have to wonder, "Was a girl buried alive here? Is she still under our feet? Does she haunt this place?" The win a dead body promotion was almost always a frozen chicken. I too was wondering about the girl encased in ice ballyhoo thing because that would probably explain how David Blaine did this exact same thing a few years ago. I guess the trick is told when the trick is sold... All of these spook show guys were basically carnival hucksters.